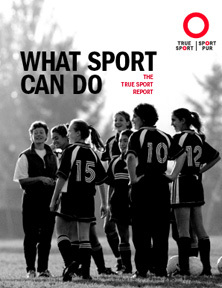 The “What Sport Can Do: The True Sport Report” provides conclusive proof of how good sport can be used intentionally to positively influence a wide range of societal goals, including child and youth development, crime prevention, education, social inclusion and economic and environmental sustainability. The Canadian Centre for Ethics in Sport commissioned the report to enable communities, policy makers and business leaders to fully understand that our community sport system is a tremendous public asset. The report offers overwhelming evidence that good community sport can deliver a broad spectrum of benefits that Canadians care about whether it is health, social, economics, or environment, while catalyzing new approaches to harnessing this powerful tool.